Blue Heaven Xpression Lip Color Pencil 03 - Bright Pink! Home ReviewsBeauty Blue Heaven Xpression Lip Color Pencil 03 – Bright Pink! Blue Heaven Xpression Lip Color Pencil 03 – Bright Pink! Who is it for? Blue Heaven Xpression Lip Color Pencil 03 is for those who love vibrant fuchsia lip colors. 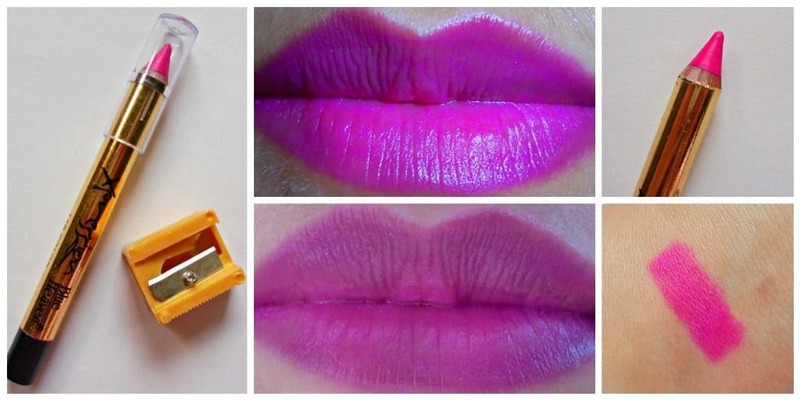 This is a perfect summer shade for hot pink lipstick lovers. This lip color comes in a chubby stick form with an individual sharpener. The packaging is flimsy and not at all a travel-friendly one. It looks like the brand has not paid the slightest bit of attention towards the packaging but concentrated on the product instead. Shade 03 is a blue toned vibrant fuchsia. It is more on the blue side than most other hot pink lip colors so it might look bluish purple on fluorescent lights. The shade is a quirky one with such an electric tone. It would make a nice party wear for evening occasions. It is a satin finish lip color without any shimmers. The texture is smooth enough but does do not have melting consistency. The formula does not sit heavily on the lips. It does emphasize dry areas of the lips so I like to exfoliate and moisturize before application. I would say the pigmentation is medium to high with this lip pencil. It gives opaque finish on my medium pigmented lips in 2-3 swipes but girls with darker lips than mine would have to build the color up a little more. It stays intact for 4-5 hours but does not survive meals. It transfers and leaves behind a pink tint to the lips. It is a fragrance-free product. Just a faint hint of castor oil smell is there but that too goes off after application. Yes. I would recommend this as a super cheap hot pink lip color with satin finish. Blue Heaven Xpression Lip Color Pencil 04 – Budget Orange! Blue Heaven Xpression Lip Color Pencil 01- Is it Good?